Biography of Mexican Fresco Painter, Socialist Realism Style. The classically trained painter Jose Clemente Orozco was one of three politically motivated modern artists who were famous for their large-scale Mexican murals - the others being Diego Rivera (1886-1957) and David Alfaro Siqueiros (1896-1974). Caught up, like the others, in the left-wing political activism of the period (c.1910-20), Orozco began his artistic career as a political cartoonist before turning to large-scale mural painting in the 1920s, joining the national arts campaign launched by the Mexican President Alvaro Obregon (1880-1928). 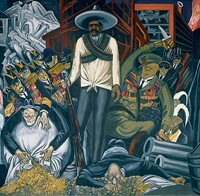 However, while he is associated with socialist realism, unlike his two artist colleagues Orozco did not join the Communist Party, and adopted a more humanistic approach in his public art which reflected his worldwide humanitarian concerns as well as the universal themes of freedom and justice and the futility of war. This less political approach brings him closer to the Social Realism movement, as led by Ben Shahn, with whom Diego Rivera collaborated on at least one mural in America. He worked intermittently in the United States for much of his life, achieving significant recognition for his modern history painting The Epic of American Civilization at Dartmouth College, New Hampshire (1932-34). Other important works by Orozco include: The House of Tears (1912), Maternity and other murals (1923-24), Omniscience (1925), Prometheus (1930) and the Guadalajara fresco cycle (1936-39). It was in the town of Guadalajara, where he spent most of his childhood, that Orozco first became interested in art. On his way to school he would pass the print shop of the graphic artist Jose Guadelupe Posada, who distributed satirical cartoons on political and social issues to the poor and illiterate. Orozco's bourgeois middle-class family did not want him to study painting, and instead enrolled him at agricultural college. It was only after a science experiment went wrong and he lost his left hand that he finally enrolled at the San Carlos Academy of Fine Arts in Mexico City. Among his teachers was Dr Gerardo Atl, who had studied Renaissance art in Italy. He was to urge the Mexican government to sponsor public mural projects. Orozco's early works included watercolour painting, such as the series called The House of Tears (1912), on local brothels and prostitutes - for Orozco a clear symbol of human degradation. They were influenced by Picasso's early drawings and paintings on the same subject. Already a master of drawing, Orozco also produced numerous caricatures and cartoons, which newspapers printed during the revolution of 1910. In 1917 he paid his first visit to the United States. He worked as a sign painter in Los Angeles and San Francisco, then in a New York factory, painting the faces on dolls. Returning to Mexico City in 1920, he joined the emerging mural painting movement. In 1923-24, along with painters like Diego Rivera and David Alfaro Siqueiros, he helped create murals for the National Preparatory School. Mainly reworkings of traditional themes, the bold symbolic images used by the artists aroused protest; a group of conservative students defaced many of them. Two years later Orozco overpainted them, and the only original mural to survive intact is Maternity (1923-24). In 1930 Orozco completed the Prometheus fresco painting at Pomona College in Claremont, California, and the four-wall mural cycle for the canteen of the New School of Social Research in New York. In 1932 he started work on the mural cycle for the Baker Library of Dartmouth College in Hanover, New Hampshire. It is his interpretation, in epic narrative terms, of the evolution of civilization in the United States from ancient migration to modern industrial man. Halfway through the Dartmouth murals, Orozco visited Europe, where he was overcome by the scale and power of Michelangelo's Sistine Chapel frescos in Rome, as well as the brooding intensity of the paintings of El Greco in Toledo. He returned to Mexico City in 1934, and began work on the mural Catharsis for the Palace of Fine Arts. In 1936 he returned to his childhood home of Guadalajara. The murals he would paint here included the image of Father Miguel Hildago (1937-38). In the 1940s Orozco was beginning to devote more time to portrait art and other types of easel painting. A commission in 1940 from the Museum of Modern Art in New York, however, resulted in another mural, Dive Bomber and Tank, depicting powerful forces - human and machine - overwhelming ordinary people. Three enormous heads, weighted down by chains and surrounded by bolts, twisted metal shapes and iron girders, appear against a background of flames. The six large panels can be arranged in any order. Paintings by Jose Clemente Orozco can be viewed either in situ, or in some of the best art museums in Mexico and North America. For a contrast in styles and artistic agenda, read about the life and work of Frida Kahlo, Diego Rivera's wife and another of Mexico's greatest painters.